Former U.S. General In Africa: 'I Think We Can' Help Find Nigerian Girls : The Two-Way Carter Ham's former command will be part of the U.S. effort to hunt for schoolgirls who were kidnapped three weeks ago by an Islamist extremist group in Nigeria. The effort to find hundreds of abducted Nigerian schoolgirls has gone international — and so has anger over the mass kidnapping, as evidenced by this protest Thursday in South Africa. Retired Gen. Carter Ham says there's still a chance for the U.S. to help. What can the U.S. — or anyone — do to return more than 200 abducted girls to their families in Nigeria? And what might happen if the U.S. engages with another violent group of extremists? Retired Gen. Carter Ham, who until last year led the U.S. African Command, says there's still a chance to help. Ham's former command will be part of the U.S. effort to search for the missing schoolgirls, who were kidnapped three weeks ago by the Islamist extremist group Boko Haram. The group's leader said this week that he plans to sell them. Ham says he suspects some of the girls may have already been sent to other countries. "I suspect they've been probably dispersed by now. That'll be a difficult challenge," Ham tells NPR's Steve Inskeep on Morning Edition. "But we have surveillance platforms, signals intelligence and other capabilities that would be helpful." 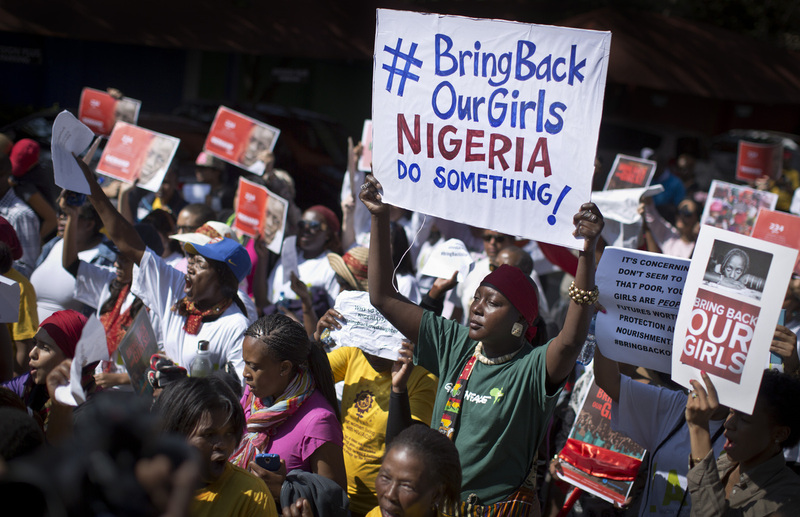 On Wednesday, Nigerian officials offered a $300,000 reward for help in finding the girls, and the country accepted a U.S. offer of help earlier this week. This comes amid worldwide protests by demonstrators venting their anger over the mass abduction. The case also has spurred a Twitter campaign around the hashtag #BringBackOurGirls; first lady Michelle Obama joined that push Wednesday. If the girls are located, Ham says he thinks U.S. agencies such as the FBI could help the Nigerian government with "hostage rescue, negotiations and care of hostages, once [they're] released. So there are a lot of capabilities the U.S. government broadly can bring to assist the Nigerians." But first, of course, the girls and their captors must be found. Ham says he doesn't think anyone will be able to talk Boko Haram's leader, Abubakar Shekau, into returning the girls. But Ham says that if it's true that the girls have been dispersed, Nigeria and its allies might have a better chance. "That means that some girls are probably held by younger, less experienced, and perhaps less ideologically committed individuals," Ham says. "And some of those might be affected by good hostage negotiation." Besides the U.S., countries such as Britain and France have offered to help. Ham says the rescue effort must also include Nigeria's neighbors, such as Niger, Chad and Cameroon. As NPR's Michele Kelemen reports, some observers are skeptical that the international effort can make a difference. They note that more than three weeks have passed since the abductions. And they say Boko Haram is entrenched in northern Nigeria's Borno state, where it has repeatedly attacked schools and villages in recent years. Another brutal attack was reported this week. "It's like a needle-in-the-haystack type of search we are talking about here," says Richard Downie of the Center for Strategic and International Studies. "A small group of personnel that the U.S. is providing, that may help, but it's unlikely to be a game changer." As for the possible repercussions that could come from the U.S. more directly opposing a militant group that targets Western entities, Ham acknowledges that the operation could "cause Boko Haram to focus more on U.S. interests." But he adds, "In a larger sense, I think if we can help Nigeria find these girls — and I think we can — then personally I'm glad to see us make that effort." NPR's Tom Bowman reports that the U.S. military team sent to Nigeria will advise the Abuja government on intelligence, surveillance, reconnaissance and logistics, according to Pentagon officials and defense analysts. "In layman's terms, they will show how the U.S. can help provide pictures of suspected sites through drones or satellites, intercept communications of the Boko Haram kidnappers and advise on possible rescue scenarios," Tom says. "The Nigerian military [needs] helicopter support, though one official said a U.S. ally, possibly the French could help," he says. "Still, FBI hostage negotiators are also heading to Nigeria in case there's a decision to work to resolve the kidnappings peacefully without a military operation."